The District Collector’s office informed TNM that they have forwarded the memorandum to the CEO for their response. Taking the Chowkidar trend into the real world from the virtual, a BJP politician in Telangana has asked that he be allowed to put his own locks on the door of the strongrooms, where EVMs are stored. 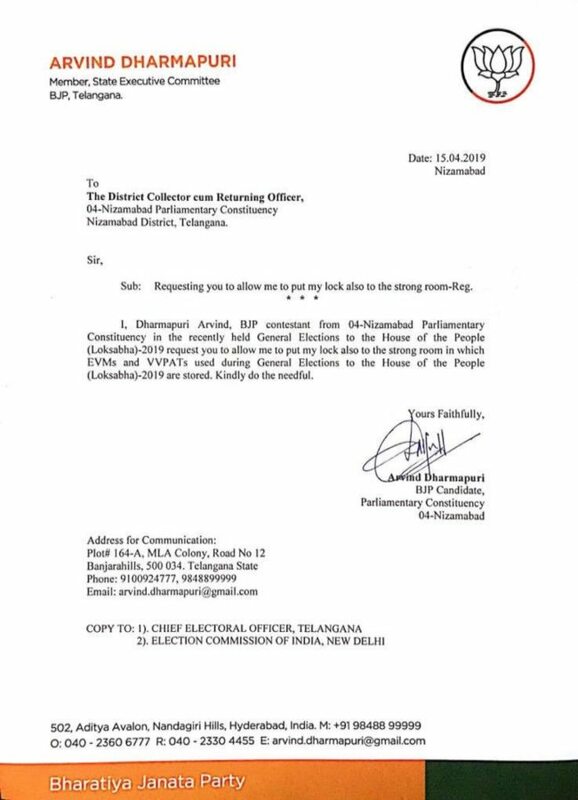 D Arvind, BJP’s MP candidate from Nizamabad, has written a letter to the Nizamabad Returning Officer on Monday, asking him to grant permission to secure the strongrooms in the constituency. In the letter, Arvind wrote, “Allow me to put my lock also to the strongroom in which EVMs and VVPATs used during General Elections to the House of People (Lok Sabha)-2019 are stored.” Arvind had contested against Kalvakuntla Kavitha, sitting MP who is also the daughter of Chief Minister K Chandrasekhar Rao. The District Collector’s office told TNM that they have forwarded the memorandum to the state Chief Electoral Officer for their response. The letter comes in the wake of the arrest of a TRS polling agent on Saturday, who entered the strongroom in Bogaram village without the knowledge of the authorities and also clicked a picture of himself, which later went viral. After Congress leaders cried foul over the laxity of the authorities, Secunderabad Cantonment Board CEO SVR Chandra Sekhar, Assistant Returning Officer of Malkajgiri constituency, filed a complaint with the police which led to his arrest. Nizamabad saw an interesting election as 185 candidates were in the fray, forcing the EC to deploy over 20,000 EVMs in the constituency to conduct the elections. Each polling station had 12 EVMs, as 174 agitating farmers of the region contested the elections to highlight their plight of not having a national turmeric board, a poll promise made by Kavitha during her 2014 campaign which remained unfulfilled.